If Republicans are going to get truly serious about cutting government spending, they are going to have to snip the umbilical cord from the Treasury to corporate America. You can’t reform welfare programs for the poor until you’ve gotten Daddy Warbucks off the dole. Voters will insist on that — as well they should. So why hasn’t it happened? Why hasn’t the GOP pledged to end corporate welfare as we know it? Part of the explanation is that too many have gotten confused about the difference between free-market capitalism and crony capitalism. And part of the problem is corporate welfare that is so well hidden from public view in the budget that no one has really measured how big this mountain of giveaway cash to the Fortune 500 really is. Finding out is like trying to break into the CIA. Until now. Open the Books, an Illinois-based watchdog group, has been scrupulously monitoring all federal grants, loans, direct payments and insurance subsidies flowing to individuals and companies. It’s an attempt to force federal agencies to release information on where the $4 trillion budget is really spent — and Open the Books will release a new report on corporate welfare payments to the Fortune 100 companies from 2000 to 2012. 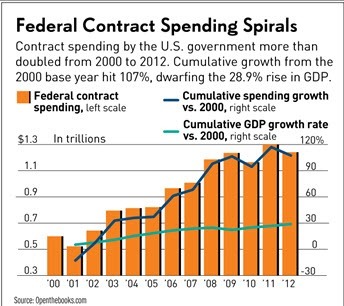 Over that period, the 100 received $1.2 trillion in payments from the federal government. That number does not include the hundreds of billions of dollars in housing, bank and auto company bailouts in 2008 and 2009, because those payments and where they went are kept mostly invisible in the federal agency books. As suspected, the biggest welfare queens in the U.S. are the super wealthy themselves, but they’d rather you focus on some single mother on welfare simply trying to survive.